Version 9.9.1 of the AT&T Global Network Client for Remote Access is available. In addition, AT&T now offers more than 1M* Wi-Fi hotspots in more than 100 countries that are available to Remote Access Users (BIS, AVTS, ANIRA, and MRAS) who utilize the AT&T Global Network Client. The total AT&T Wi-Fi footprint is comprised of both AT&T Wi-Fi branded locations and AT&T partner Wi-Fi locations across the world. * All hot spots available in version 9.2 and later. Earlier versions support no more than approximately 700K hotspots. AT&T mobility (cellular) devices. The majority of customers use this version. This version does NOT contain VPN data encryption software so it can be used in export restricted countries for AT&T Business Internet Services customers. 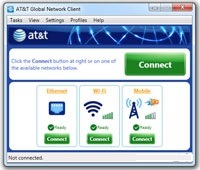 The AT&T Global Network Client is available in two installation packages. Following are the features available in the packages. All installation packages install on all supported operating systems: Microsoft Windows 7 (32-bit), Microsoft Windows 7 (64-bit), Microsoft Windows 8* (32-bit), Microsoft Windows 8 (64-bit)*, Microsoft Windows 10 (32-bit) and Microsoft Windows 10 (64-bit).